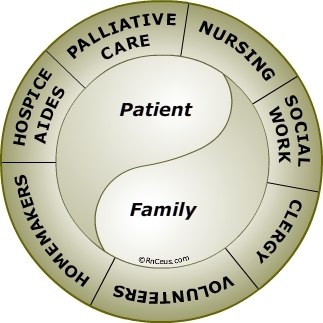 Hospice is a patient service delivery system that provides palliative care for patients who have a limited life expectancy and require comprehensive biomedical, psychosocial, and spiritual support as they enter the terminal stage of an illness or condition. It also supports family members coping with the complex consequences of illness, disability, and aging as death nears (p.3). In 2014, approximately 1.6 to 1.7 million people received hospice services (NHPCO, 2015). Hospice provides palliative care focused on management of symptoms caused by a terminal illness. Symptoms treated by palliative care can include: pain, nausea, GI upsets, excessive secretions and so forth. The patient care approach is on support and comfort, not on curing the terminal illness. The emphasis is caring for the ‘whole person’ including physical, emotional, social and spiritual care. In a study by the Pew Research Center (2013) while 57% of adults would prefer to stop treatment so they could die if they had an incurable, painful disease, 35% would tell their doctors to do everything to save their lives. The remaining 8% were uncertain. It is important for health professionals to provide information about hospice while respecting the preferences of the patient. When an illness has advanced beyond the possibility of a cure, research has shown that early enrollment in hospice care helps patient live longer with better quality of life (Connor, Pyenson, Fitch, Spence & Iwasaki, 2007). Other benefits include assistance for the family that may decrease complicated bereavement and increase preparation for the death of a loved one. Nilsson et al. (2011) found younger patients who were white, without a DNR order and in the ICU during the last week of life had the worse quality of life at the end of life. Patients who reached a feeling of inner peace and were cared for by an oncologist who saw them as a person were more likely to have a better quality of life. Section 3004 of the Patient Protection Affordable Care Act, 2010, requires that all Medicare certified hospices submit quality of care data to the Centers for Medicare and Medicaid Services (CMS). Hospice providers that fail to meet reporting requirements will receive a 2-percentage point reduction in reimbursement. The CMS uses this data to calculate quality compliance with measures endorsed by the National Quality Forum (NQF). Percentage of vulnerable adults (including hospice patients) treated with an opioid that are offered/prescribed a bowel regimen or documentation of why this was not needed. Percentage of hospice or palliative care patients who were screened for pain during the hospice admission evaluation / palliative care initial encounter. This quality measure is defined as the percentage of hospice or palliative care patients who screened positive for pain and who received a clinical assessment of pain within 24 hours of screening. Percentage of hospice or palliative care patients who were screened for dyspnea during the hospice admission evaluation / palliative care initial encounter. Percentage of patients who screened positive for dyspnea who received treatment within 24 hours of screening. Percentage of patients with chart documentation of preferences for life sustaining treatments. This measure reflects the percentage of hospice patients with documentation of a discussion of spiritual/religious concerns or documentation that the patient/caregiver/family did not want to discuss. Committee on approaching death: Addressing key end of life issues, institute of Medicine (2015). Dying in America: Improving Quality and Honoring Individual Preferences Near the End of Life 1st Edition. Washington, DC: National Academies Press. Connor, S.R., Pyenson, B., Fitch, K., Spence, C. & Iwasaki, K. (2007). Comparing hospice and nonhospice patient survival among patients who die within a three-year window. J Pain Symptom Manage,33(3),238-46. Nilsson, M. E., Zhang, B., Reitschuler-Cross, E., Wright, A. A, Gao, X., Temel, J. S. et al. (2011). What leads to better quality of life at the end of life? J Clin Oncol. 29(15), 9040.